These were recommended by fans during the year of 2006. See the Recommended Anthropomorphics List to read and recommend worthy efforts for this year! Secondly, this List is to be used as a helpful guide for nominations to the 2006 Ursa Major Awards, which will be presented during 2006 for the Best of the calendar year 2006 in the first ten categories of the Recommended List. The List was actually started as an aid to those fans who said, "The Awards sound like a good idea but I don't have the slightest idea what's eligible to be nominated." Read the List and find out what is eligible for the Best of 2006. Arenhaus, Eugene. Cover art for Extinctioners #15 by Shawntae Howard. Fee the Bunny. 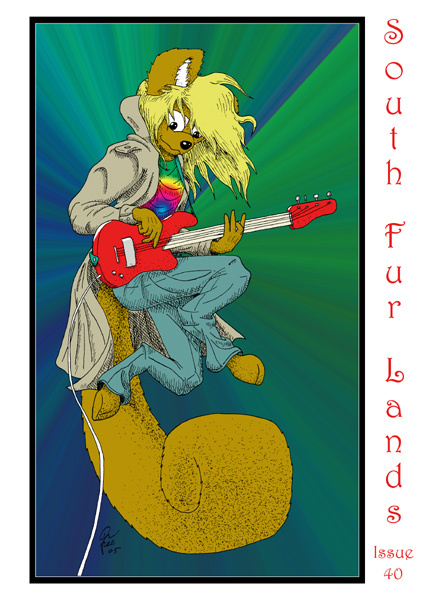 Cover art for South Fur Lands #40. Parsons, Mark "Gideon". Cover of Genus Male Issue #5. Yiffstar, by various authors and artists. Large on-line adults-only fiction and art collection.